Once upon a time, the boundless imagination of master storyteller James C. Christensen created a series of paintings under the guise of an obscure (and fictitious) 15th century Flemish painter only know as the “Master of the Enoch Altarpiece.” This enigmatic collection became known as Saints and Angels for its similarities to the devotional art of that era, as well as its portrayals of largely forgotten Christian saints. "Portrait of Isabella Grimaldi" as an Angel encapsulates the beauty an artist can create when inspiration strikes. Painting as the “Master,” Christensen imagined himself commissioned to create the work by a patroness from an influential family of Venice. 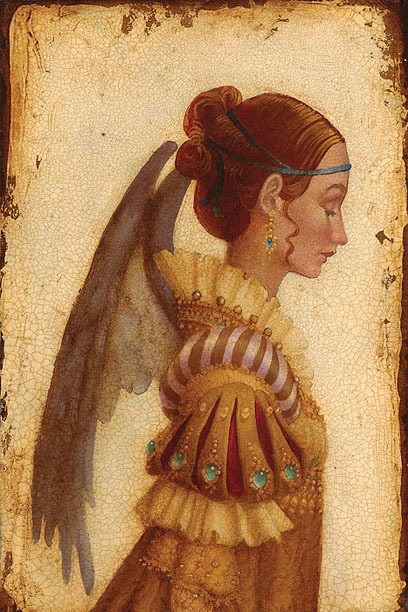 It was customary at the time for the wealthy to request their portraits take on the literal characteristics of angels but may also reflect the Master’s appreciation of Isabella as his muse.